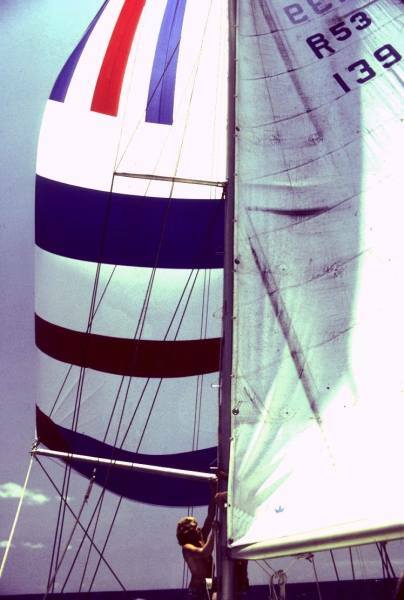 Sabi Star was the first ocean-going sailboat we ever sailed on. The name comes from a Rhodesian flower. We didn't own Sabi Star, but we crewed on her for 3 months, from Capetown, South Africa to Martinique in the Caribbean, via St. Helena Island (in the middle of the Atlantic), Brazil (Recife, Fortaleza, and Belem), and Barbados. Interesting side-note: The new owners of Sabi Star recently found this website article and contacted us. The boat's been completely refitted inside and out, and looks beautiful! Her systems have been upgraded to ocean cruising standards and she's now taking "her" new family cruising under the name Colomba! We started out with Reg, 8 paying crew (including ourselves), and Howard (the skipper) who got a free passage in return for his excellent navigation and sail handling skills. Howard also had delightful people skills. Most skippers turn into raving, ego-centric lunatics at about 100 yards offshore, requiring exact obedience to their cryptic commands. Howard was very easy going, with a twinkle in his blue eyes, and a little smile surrounding his pipe under his blond mustache. I remember once out on a test sail when the helmsperson lost concentration and jibed the mainsail, causing the boom to slam over to the opposite side of the boat. Realizing their error, the helmsperson corrected the course, causing the boom to slam back to the original side, with much crashing and banging. If anyone had been in the way of the boom, they could have been seriously hurt. Instead of coming unglued, Howard simply plucked the pipe out of his mouth, quietly said, "Don't do that", and replaced his pipe. A joy to have on board. Unfortunately, while the owner was initially just "one of the guys", his wife joined us in Brazil. She contributed nothing positive to the trip, hogging the best seat in the cockpit, smoking and complaining continuously. After her arrival, there was a distinct management/crew division, with poor Howard stuck in the middle. Eight hours out of Cape Town, we got hammered by a huge storm that lasted for 3 days. Half the crew were wearing buckets around their necks and the rest of us were standing double and triple watches for them. Sue and I were double-dosing our seasick pills to make sure we'd be OK (Stugeron, excellent and non-drowsy making, but not available in the US). Down below, we found that the galley had been improperly stowed, and a big bottle of cooking oil leapt out of its rack, hit the floor, ruptured, and splashed across the saloon floor. This was soon followed by a big bag of rice, making navigation across the saloon a dodgy proposition. The rope we'd rigged to stop the propeller shaft from turning broke, so the bad bearing was howling as the waves pushed us along. The pitch and volume of the scream (which was more-or-less right under our cabin) changed with boat-speed, which made sleep almost impossible for us as the boat sped up going down the waves, and then slowed down as it climbed the next swell. Out on deck, the waves were huge, and several wave-trains were striking us from all sides. When some of them came together, we'd have these huge mountains of water, perhaps 30' high, suddenly appearing next to the boat. 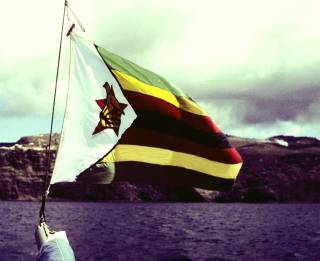 One of these walloped the bow, punching in a window and drenching the 2 seasick Rhodesians in that cabin. We quickly stuffed a pillow in the broken window, tried to convince the 2 that the boat was not (yet) sinking, and sent them off to the owner's aft cabin. About an hour later, the window in that cabin was also punched in, making the poor Rhodesians feel unfairly persecuted. Despite this inauspicious beginning, we generally enjoyed the trip. The storm blew us right into the trades, which gave us nice following breezes. With so many people on board, our watch schedule was very relaxed. We stood 2 hour watches, the first hour just sitting in the cockpit watching for other boats, and the second actually steering. We had no autopilot or other self-steering device, but we actually looked forwards to our watch. Then we had 7 hours off to do what we liked. Every 10 days we'd have no watches at all but we'd be responsible for all meals and clean-up. After 2 weeks, and with only Howard and his plastic sextant to guide us, we hit 9 square mile St. Helena dead square on. 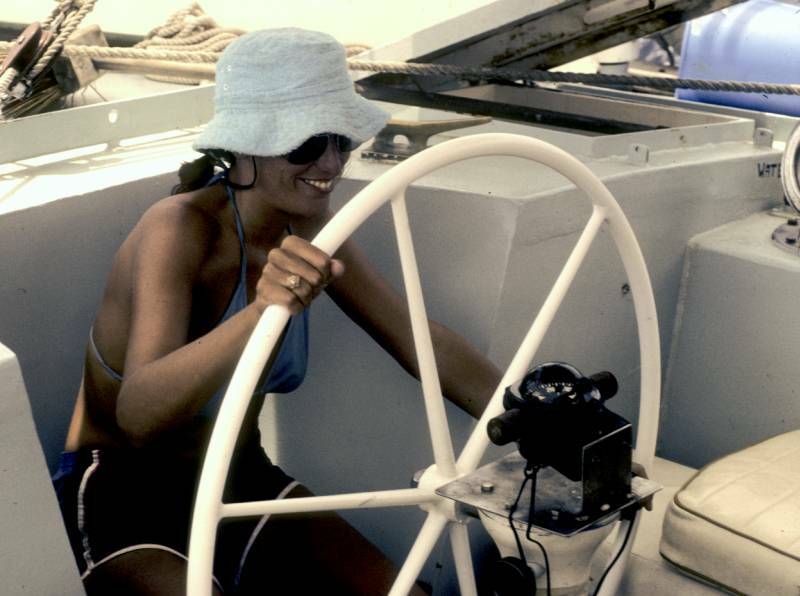 (Sue and I eventually got lessons from Howard on the basics of celestial navigation, including identifying the stars, sextant use, and reducing sights, as we didn't want to rely solely on just one navigator.) We spent a delightful few days exploring St. Helena, including getting a tour of Napoleon's estates, where he was exiled. 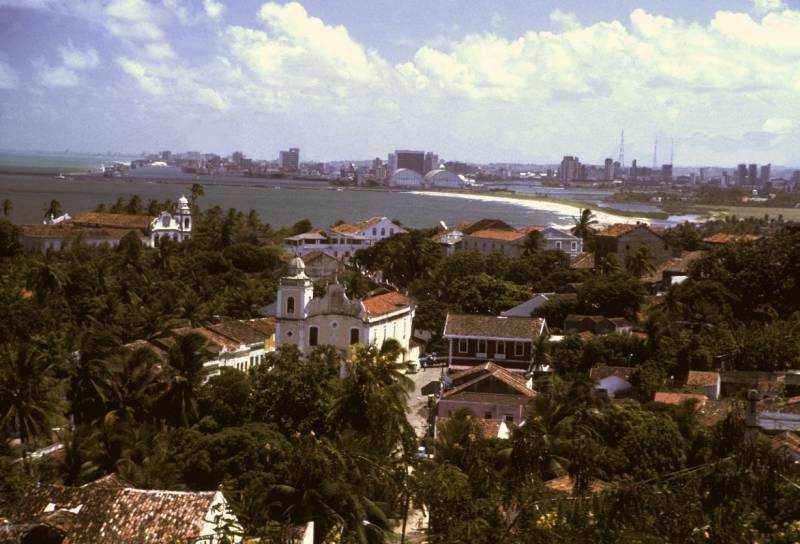 The 2 week sail to Recife, Brazil was slow but uneventful. To give you an idea of how slow Sabi Star was then, we once threw our garbage overboard - and, I kid you not, it passed us. How embarrassing. But Howard eventually worked out a way to fly the spinnaker with only the 1 sheet winch to control it, so at least we had a pretty sail to watch. 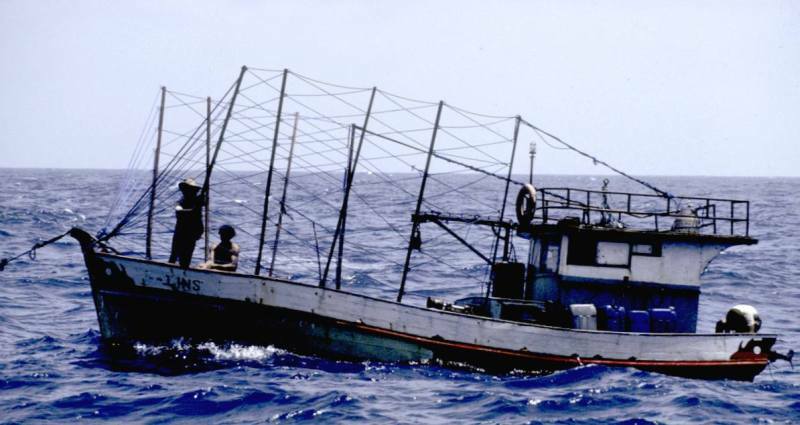 The South Africans and Rhodesians reckoned they were the best fishermen (and drinkers) on earth, so they were constantly arguing about where and how to rig our fishing lines. (I'm no fisherman, but at least I know it, so I stayed clear of these discussions.) Still, with all this 'expertise' on board, we only ever caught 2 fish, both off the coast of Brazil. The first was obviously a barracuda - a bit oily but it gave us several good meals. The second, caught just 8 hours later, was this big yellow-green-blue fish with a bulbous head. We got it on board and watched it change through several strange and somewhat nauseating colors as it died. The fishermen on board didn't know what it was, so they stored it in the (gas powered) freezer. When we finally tried it several days later, it was delicious, but then the freezer died so we had to throw the rest out. Fishermen reading this will recognize this fish as a Dorado or Mahi-Mahi, probably the best eating fish in the tropics. We'd been eating barracuda when we could have had Mahi-Mahi! There was a bit of a problem in Recife as we didn't have visas for Brazil, but Sue had been studying the Portuguese dictionary so she could communicate a bit. Add some female tears, and the (Latin American male) immigration officers soon bent the rules to let us stay for Carnival. Soon afterwards, friends we'd met in Cape Town on the beautiful Norwegian gaff-ketch, Capricornus, also arrived. Sue and Margie (the only other young woman on board) were in lust with the 3 young, gorgeous Norwegians on board. This was the first port they had repeated in their 4.5 year circumnavigation, so we had 3 days of around-the-world party that led smoothly into about 10 days of Carnival. 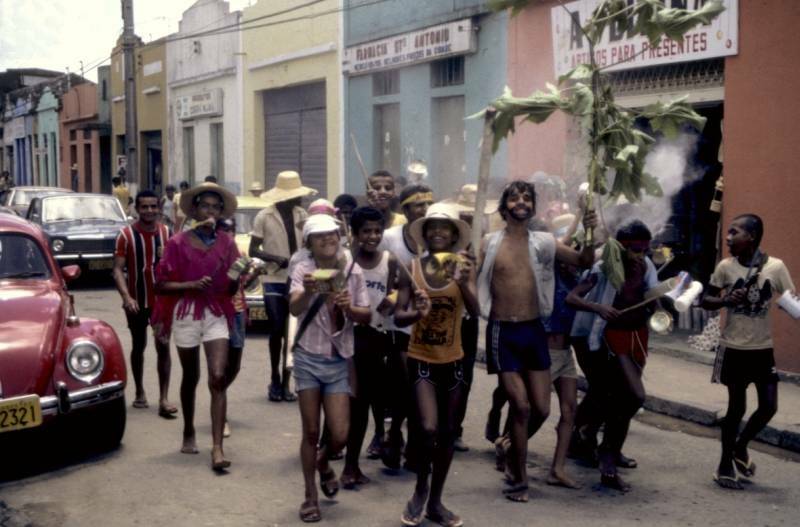 Carnival in Recife isn't as big as Rio de Janeiro, but it's close. There was a big, sweaty dancing party at the yacht club, with all sorts of elaborate costumes, but most of our celebrations were done in the old town of Olinda, just north of Recife. There they'd put live bands on the backs of big flat-bed trucks and let them grind slowly through the narrow, cobble-stoned streets. 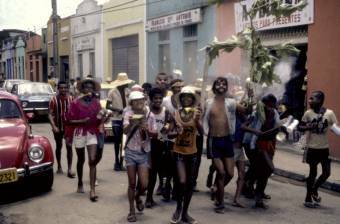 Dancers would stream out behind the bands like tails, gyrating wildly in the streets to the "Frevo" music. When these trucks would meet, dancers could decide which band they preferred to dance behind. When we got tired of dancing, there were lots of food stalls in the various plazas. Good fun. Off Brazil another little vignette unfolded. We were sailing along, dodging between the fishing boats offshore, when we noticed a boat chasing us. We couldn't tell what kind of boat it was, or what they wanted, but it was about the size of a small fishing trawler. We decided to crowd on as much sail as we could, as we'd heard bad stories about this coast. For a while we out-distanced them but just as they'd appeared to give up, the wind died. We tried to motor away, but our pathetic 3 knots was no match for the trawler. We watched with some trepidation as the other boat pulled up parallel to us and threw us a line. They'd obviously done this before. They tied their end to a bucket with another line, and indicated we should pull our end in. We did so and found the bucket was full of lobsters! We asked what they wanted and they shouted, "Cigaros, whiskey!" Reg declared he wasn't going to "waste" his whiskey, but we put a couple cartons of cigarettes and a bottle of port in the bucket and they pulled it back. They seemed happy with the trade, waved a friendly goodbye, and motored off. Then the 4 Rhodesians declared that they weren't going to eat "scavengers" so the rest of us had that much more lobster that night! It was in Brazil that Sue and I realized the potential value of cruising, and started thinking about it as a lifestyle for ourselves. To be able to travel in relative comfort and still have most of your house with you! To be able to explore the different peoples, cultures, and their values for essentially as long as we liked, without having to pay hotel bills! What an opportunity! But before we could buy our own boat, we got to experience a dark side of cruising - Piracy!